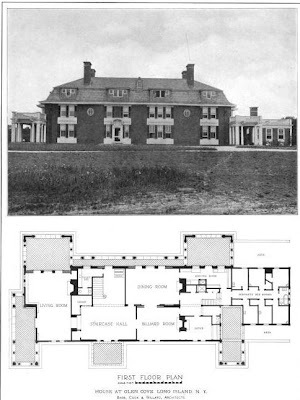 'Welwyn', the Harold I. Pratt estate designed by Babb, Cook & Willard c. 1906 in Glen Cove. Pratt was a chairman of the board of North American Reassurance Co., president of the boards of North Shore Community Hospital and Brooklyn Hospital and treasurer and director of Morris Building Co. among many other things. 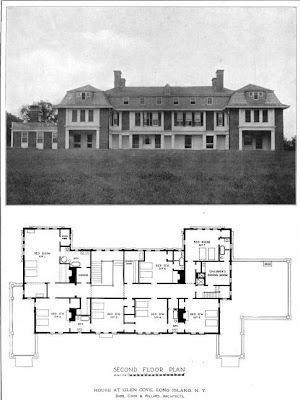 He hired Delano & Aldrich to design alterations to the house in the early 1920s which can be seen HERE. Click HERE for more on 'Welwyn' (be sure to scroll past today's post). Click HERE to see 'Welwyn' on google earth and HERE on bing. 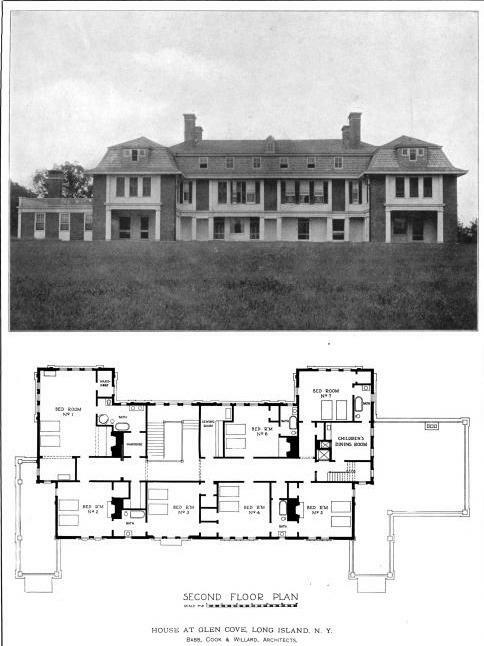 Although the exterior was visually improved by the Delano and Aldrich alteration, the resulting floorplan was awkward and odd: The Serving pantry and back stairs were removed and replaced by an enormous oak panelled dining room which resulted in the old dining room (I'm not sure what its new use was)becoming a room sized hall to the new dining room and leaving the Billiard Room and Office curiously stranded in terms of flow. It is also strange how simple and almost austere the finishes were. Other than a rather attractive pine panelled living room that was reconfigured out of the original living room, the rest of the house is nothing short of disappointing. And post the Delano alterations, the bedrooms retained their very simple wood mantles clearly original to the house and much more evocative of a shingled cottage than a grand brick behemoth. • On the original ground floor there was no way to get from the service wing to the front door without going through either the dining room or the billiard room, which I think is a mistake (there should be a hallway) – was this corrected in the alterations? • On the second floor the connecting doors between the bedrooms & bathrooms along the front of the house are lined up so you could see from one end to the other if all the doors were open; not sure if that’s a good thing or a bad thing but wonder if it was changed. • I’m glad to see the children’s’ dining room is on the second floor & wonder if in the alterations it was further removed to the now windowless section of the third story (joke, but not entirely). I noted the elevator is in the servants’ section, so I loose that argument again. DFP: Delano and Aldrich actually created a parapet around the third floor so that the house appeared to be only two stories tall, with the third floor windows hidden behind the paprapet. I am sure that the enfilade created by lining up the bedroom doors had more to do with airflow in a pre-airconditioned era than any aesthetic consideration. And, if i reacall, the second floor remained virtually unchanged post alteration. TY Magnus; on the Bing view I could see the parapet & 3rd floor windows on the back of the house but if there's a similar arrangement on the front then it's a really tight fit. & of course you're correct about the air flow consideration on the second floor -- I keep forgetting about that creating the trade off between privacy & comfort not so long ago. & of course it's 'lose that argument' not 'loose' -- spell check doesn't save me every time. I'll be darned. I always assumed that the round windows on the second floor were part of D & A's alterations, as such windows were one of their design signatures, but there they are, in the original version. I know I've been harping along on this theme lately, but notice one again that all the first floor servant's rooms, bath, and hall occupy the equivalent space of one of the larger first floor reception rooms. And ponder the poor servant with a view-less room behind the new parapet on the third floor. If one visits the Elms in Newport, where the servants rooms are larger and better finished than many, the effect is nevertheless of a prison camp, all rooms looking out on a view and light blocking walkway behind the blind parapet balustrade. Remember when romanticizing the lives led by the few in these wonderful houses, that the many who supported those lives were packed in like cattle and working 10 hour days. And Delano and Aldrich clearly struggled to "Federalize" that mansard roof. The parapet may have been the only solution possible, but it makes the house appear awkwardly tall. And additional awkwardness is the last thing the original structure needed. The Pratts were certainly prolific in their architectural comissions, but as a whole they were not, my sense is, a particularly stylish or aesthetically gifted group. Welwyn is only one of their many houses that just doesn't have "it". Now, as I typed in "submit" on my previous post, I suddenly remembered the Harold Pratt's New York Townhouse, now the Council on Foreign Relations headquarters at 58 East 68th Street in New York. To my mind, it is one of the best Delano and Aldrich townhouses ever, both inside and out. Sorry for my previous post, Mr. and Mrs. Pratt. Have always thought Welwyn to be just alittle awkward looking but the setting is magnificent. That being said, the Braes and Killenworth are the best in my opinion. All however have suffered from much loss of original landscaping and mature trees which grounded all the homes. The Manor and Popular Hill have both lost significant aesthetic appeal due to unsympathetic additions, but also tremendous tree loss surrounding the structures. Since we also seem to be on the subject of servants lives at many of these grand homes, I am reminded of "The New Leaf" filmed at Welwyn in which the servants ruled the household. A very funny movie. This will tie into The Pratt family with a question for OldFormerLI. With Christmas ten days away, did the Pratt family decorate for the holidays? My understanding most of the estates were closed for the season. The Ferguson Castle folk put up a tree but you never see any old photos of Christmas decorations at any LIGC esate. Can you imagine if LCTiffany had LED lights and a computer? I can't say for certain. In their heyday, they may have, but growing up, I remember those estates that were decorated, were very restrained and tasteful. Remember, you can't see most of the houses from the road. The gates sometimes had wreaths, candle lights in the gate house windows and the occasional white lighted tree. The real light show was on Perry Avenue in Bayville. It was really over the top (a la National Lampoon's Christmas Vacation), and the antethesis of the estate decorations. The new owners of old estates (in particular, the Arthur Vining Davis place in Mill Neck) sometimes went all out, often with mixed results. As far as the houses themselves go, those who knew are long deceased. My great uncle who ran household at the Manor and later at Oak Point would have been a great source of detail, but his genetation and most of their children have also passed. Another thing worth mentioning is that the great estates were in decline by the time us baby boomers arrived, so unless other documentation exists, there's really knowing what was done at their peak. I suspect that christmas displays at "Museum Estates" such as Old Westbury Gardens, Planting Fields and farther away (Winterthur, Longwood Gardens, Biltmore Estate) attempt to replicate family Christmas decorating traditions. One little detail I know first hand. The original owner of Sefton Manor left a few old-time toboggans that sat six people or so in the basement of the main house which we later used with great fun down the main lawn, as the original family no doubt did. I still remember the leather seat cushions and the ropes that you held on to and used for steering (along with your body where everyone would lean in one direction or the other.) To me, it's a reminder that real people had real fun in these houses -- to many, they weren't just monuments to themselves, but home and maybe even the servants got a turn or two on the toboggans. HPHS: an entry in a society column in a 1920's newspaper whose source I can no longer remember stated that the Pratts typically spent Christmas in New York with the families of the various brothers taking turns hosting the huge family get togethers that were an annual Pratt family event a few days before Christmas. I use to walk these woods as a teenager, I remember in the fall all the screaming blackbirds above my head, so many. In that time you could walk to the gazebo at the end of the jetty. The Greenhouse broken, the gardens in ruin. One time walking the back road from the beach which leads to the Killingworth Estate wall, a man jumped over the wall, right in front of me, he looked at me for two seconds and then ran off. Must of been a defector from the USSR.